Robert Nowlin, Paul Holm, and Joel Quiles allegedly stole thousands in copper and scrapped it for personal profit. Three Long Island Rail Road employees have been charged with stealing and scrapping thousands of dollars worth of copper that belonged to the Rail Road. Nassau County District Attorney Kathleen Rice announced that Paul Holm, Robert Nowlin (aka Darryl Nowlin), and Joel Quiles (pictured right, left to right) surrendered to the District Attorney and MTA Authorities on Friday. The three suspects work in the LIRR’s communication department located in Huntington, and all three have been suspended without pay. These arrests stem from a investigation one that resulted in the indictment of 15 LIRR employees last January. During the original investigation, it was determined that the conspiricy to steal copper wire from the LIRR had dated back to January of 2010, and involved many players. 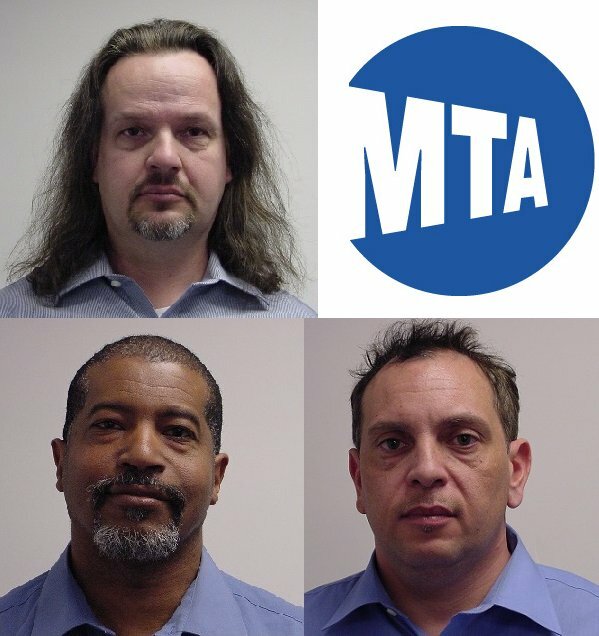 Eventually, Nowlin, Holm, and Quiles were ousted by DA Rice and the MTA Police & MTA Inspector General, who pooled their resources together and continued to investigate the case after the original batch of arrests. In a statement, LIRR President Helena E. Williams praised the hard work of the DA's Office, MTA Police, and MTA Inspector General's Office for their work on this case. "The LIRR does not tolerate employees who steal from their employer and from the taxpayers who support our operation...We are grateful to the MTA Inspector General’s Office and the Nassau District Attorney’s Office for vigorously pursuing these cases." The joint investigation found that the three men allegedly stole copper wire from right of ways, often times while on duty. Once the wire was in their possession, the suspects used LIRR trucks to transport it to their own personal vehicles. The copper wire was then sold for scrap, with proceeds being divides up amonst the three men, and the other members of their work gang. The men foolishly completed the transactions used their driver’s licenses, creating a paper trail for their crimes. According to DA Rice's office, the theft and sale of the copper happened between February 15, 2011 and April 15, 2011, as well as during the months of November and December 2012. Nowlin is facing charges of Grand Larceny in the Third Degree, Criminal Possession of Stolen Property in the Third Degree, Grand Larceny in the Fourth Degree, and Criminal Possession of Stolen Property in the Fourth Degree. If convicted he faces 2 -1/3 to 7 years behind bars. His bail has been set at $20,000 cash or bond. Holm and Quiles were charged with Grand Larceny in the Fourth Degree, and Criminal Possession of Stolen Property in the Fourth Degree. They are facing 1-1/3 to four years in prison and their bail has been set to $10,000 cash or bond. Subject: LongIsland.com - Your Name sent you Article details of "Three LIRR Employees Charged with Stealing Copper While on the Job"